Does Income Growth Drive the Housing Market in Toronto? Data can be manipulated just like public opinion. In fact I believe both go hand in hand. The best part about data manipulation is that there's no need to make up data because all that matters is the presentation. All you have to do is pick a time interval that suits your needs and adjust the scale to your liking. To illustrate, I can easily create a chart which would create an impression that income growth in Toronto followed the real estate appreciation. In the chart below I adjusted the scale of median hourly wage so it would seem as if incomes grew at the same rate as housing. 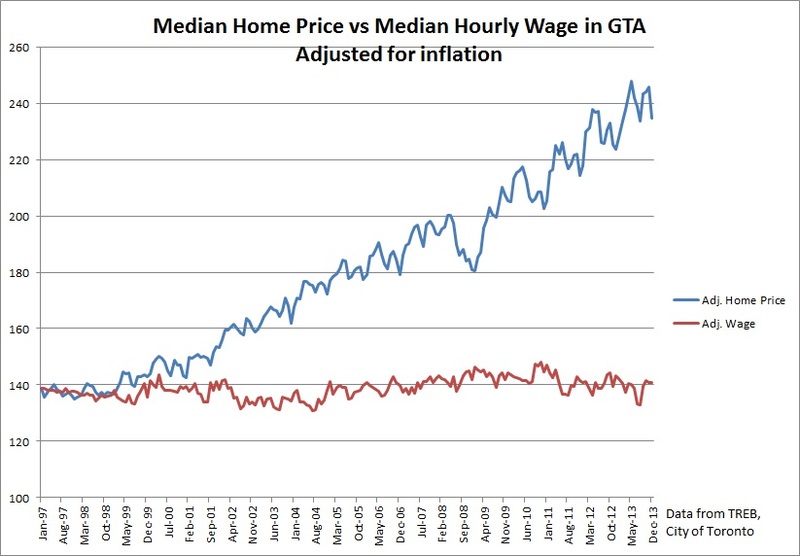 In case you were wondering, the median hourly wage in Toronto was $21.15 in December 2013. And that's before taxes. 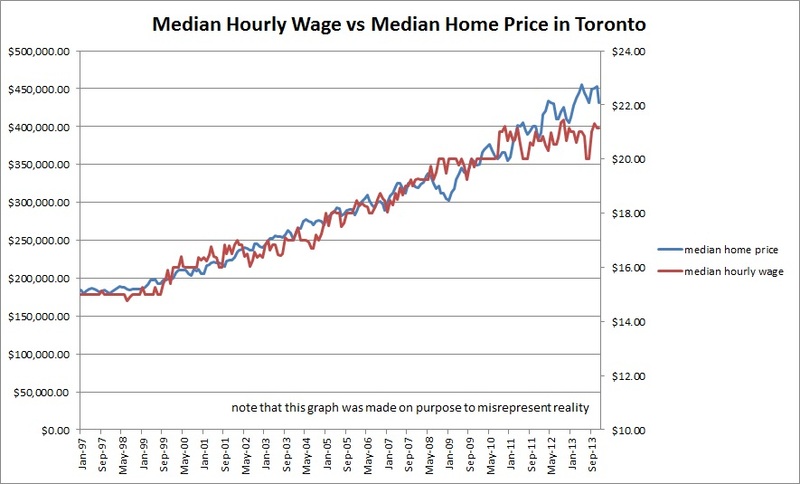 That is a 41% increase from December 1997 when the median hourly wage in Toronto was $15.00. During the same period, the median home price in Toronto went up by 134%. Now 41% income growth and 134% real estate appreciation is not reflected in the above graph. 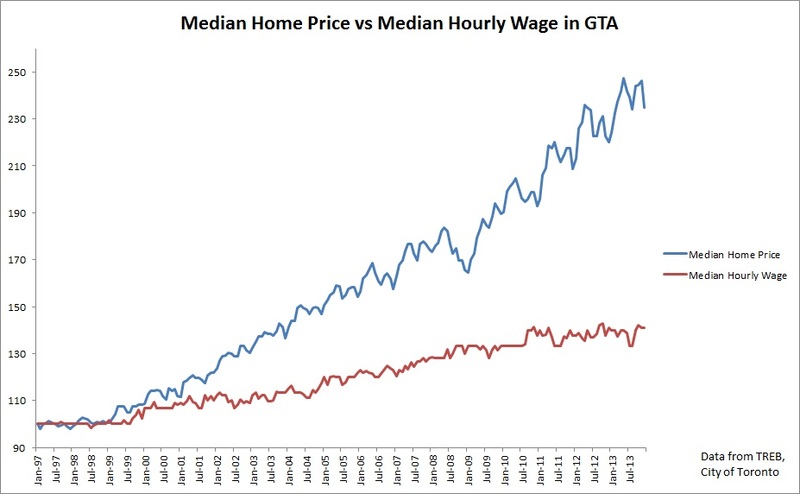 In order to really show what was happening to hourly wages and home prices between 1997 and 2013 in Toronto you would have to create an index. Do that and you will get the chart below. Now the above chart looks more realistic but it still doesn't reflect the reality as with each passing year money was worth less. But wait... it gets scarier! 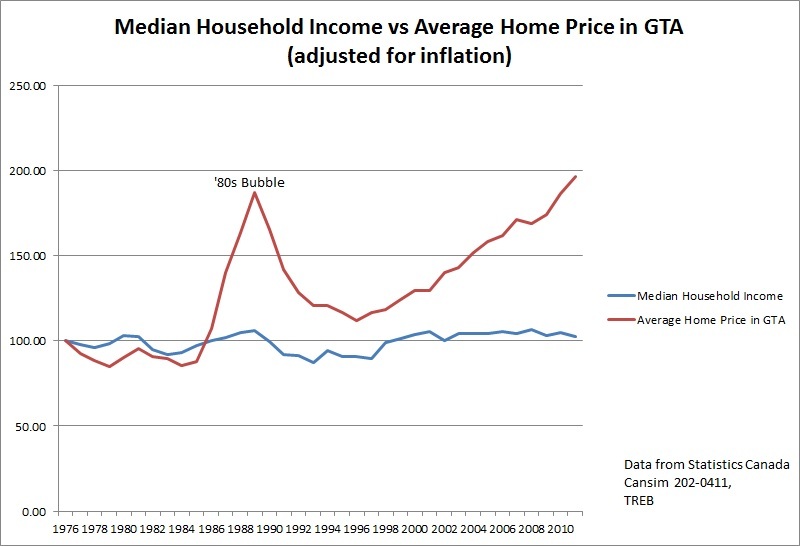 The data series for the median hourly wage starts in 1997 so in order to go further into the past I compared median household income vs average home price in GTA. Now let's add interest rates to the mix in order to have a complete view. After all, ultra low emergency interest rates did fill in the affordability gap. 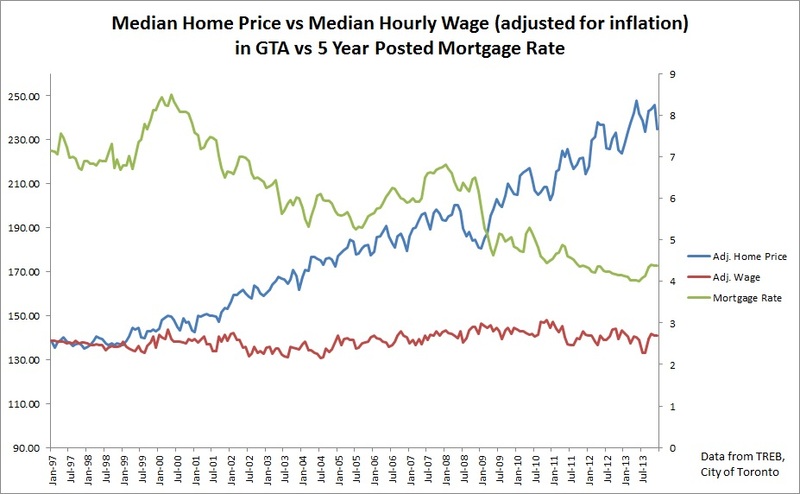 So does income growth drive the housing market in Toronto? The answer is simply... nope! Now you might think that low interest rates are the main driver of the real estate market. But that is not the case. The reason why interest rates are not the main force behind the home price appreciation can be found in the above chart. If you don't see it, you will have to wait for my next post. Low interest rates mean low debt-service ratio and thus one can carry more debt. Simply put, emergency low interest rates make housing more affordable. Once the rates rise that won't be the case as reflected by the blue line in the chart below. Another issue to consider is that affordability measures depend on who creates them. Once again they can be manipulated to make it seem better or worse than it really is. Compare the two affordability indexes for Toronto. One from Canso Investments and the other one from RBC.